Zhang Daoling, the first Celestial Master. This is a list of the Celestial Masters, leaders of Zhengyi Dao, continuing Wudoumi Dao (Way of the Five Pecks of Rice). After the death of the 64th Celestial Master Zhang Yuanxian in 2008, controversy arose over the legitimate succession, with different descendants claiming to be the rightwise 65th Celestial Master, including Zhang Jintao and three other claimants in China mainland; and Zhang Yijiang and Zhang Meiliang in Taiwan. Another Taiwanese master, Zhang Daochen, claims to be the legitimate 64th Celestial Master, as, according to him, Zhang Yuanxian wasn't. 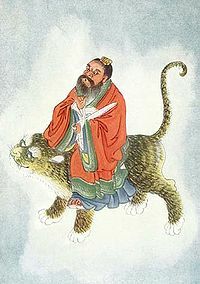 In English the Celestial Master was also known as the "Taoist pontiff". 29 Zhang Jingduan 张景瑞 1049?-1100? 39 Zhang Sicheng 张嗣成 ?-1344? ^ Kleeman, Terry. "Tianshi Dao," in Encyclopedia of Taoism, Fabrizio Pregadio, ed., (London: Routledge, 2008), 983. ^ The China Post: Who’s going to be the 65th Taoist pope? ^ Victor Purcell (3 June 2010). The Boxer Uprising: A Background Study. Cambridge University Press. pp. 139–. ISBN 978-0-521-14812-2. ^ Modern Chinese Religion I (2 vol.set): Song-Liao-Jin-Yuan (960-1368 AD). BRILL. 8 December 2014. pp. 1035–. ISBN 978-90-04-27164-7. ^ H.S. Brunnert; V.V. Hagelstrom (15 April 2013). Present Day Political Organization of China. Routledge. pp. 494–. ISBN 978-1-135-79795-9. This page was last edited on 3 March 2019, at 02:13 (UTC).